This is a beautiful well acted, poignant and powerful drama that touches you on many levels. 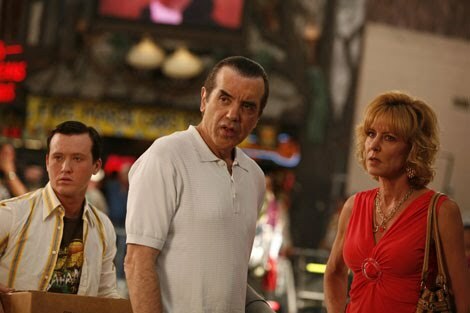 It stars the superb Chazz Palminteri(The Usual suspects) as Yonkers Joe who along with his gambling pals and girlfriend Janice played by the warm and lovely Christine Lahti(Chicago Hope) regularly swindles other people and establishments on cards or other casino based games. We meet Joe early on as he is told his disabled son Joe jnr. played superbly and convincingly by Tom Guiry(The Black Donnellys)(he reminds me a little of Sean Penn in appearance and manner especially in I am Sam) is about to turn 21, and the current establishment cannot hold him any longer, since he is getting too violent and abusive to staff. We learn that Joe blames the disability of his son as punishment for the life of swindling that he has led so far, he is told either he has to send his son to a very expensive institution specific for his needs, or he stays with him for six months until he is reviewed again. In the process of having his son stay with him thus far, the absent father, and abandoned son get to iron out their problems. The acting is superb, and the tension in some of the scenes is tangible, ensuring that you watch with anticipation to see how it all unfolds. Some of the disturbing scenes were dealt with surprisingly well, never loosing perspective that nothing is simply black and white.